How to get that Sultans of Swing Sound – Mark Knopfler played 08 strings? It cannot be answered with 100% certainty which string gauge or brand Mark Knopfler played on e.g. the first Dire Straits album or on Communique. There were a few interviews with major guitar magazines, but unfortunately none of these asked for strings. For a long time the earliest information was from the Making Movies tour book which listed Fender Extra Lights for this tour. However, this was late 1980 and Knopfler meanwhile had changed to a different guitar (Schecters instead of vintage Fenders) and completely different gear (e.g. all that rack stuff). Fender Extra Lights were pure nickel strings with gauges 09, 11, 15, 24, 32, 40 (they have different gauges these days: 16 instead of 15, 42 instead of 40 !). On the next tour he also played 09ers (Deam Markley Custom Light: 09,011,016,026,036,046) so it seemed he was a 09-player in all those years. It was only a few years ago that I bought a guitar magazine from 1980 with Knopfler and his red Strat on the front cover on ebay. This was Musician from July 1980. Fender Super Lights was a 08 set (08, 11, 14, 22, 32, 38), also pure nickel. Of course the magazine does not say explicitely that these were used on any of the first CDs or on the first tours, but nevertheless, it is the earliest available information. I myself had started to use thinner strings on most of my Strats since a few years before because I had the feeling they make some particular licks sound more like those old Dire Straits sound, also Fender and almost the same gauges as the Super Lights (only difference: I favour a 09 instead of 08 for the high e string), so I can indeed say that to me 08 sounds pretty good. To all other readers who read this blog regularly and are not familiar with RSS: You find the RSS subscribing uner Meta in the left sidebar, or at the bottom of each page. Use it to subscribe to the blog, which means you are automatically informed about any new posts (or also comments if you want) directly in your browser or your feed reader software. Hi Ingo, I absolutely agree with that with the 8-38’s strings. I have practice very much with the string gauges and these can give you that extra highs in tone and that clear warm tone on the havier strings, versus the muddier tone that give a heavier gauge. Also I want to ask you which of the tubes Rca-Mullard you think he uses on the 1’st and 2’nd album? Have you an experiement (like me) with these tubes? And in the 70ies there were much more companies in the business than today. I a/b compared different tubes a long time ago, but today I normally have two or three 12Ax7 at stock and simply plug them in, with some ampy I like this, with others that one. I tried a few Chinese tubes which I did not like that much. 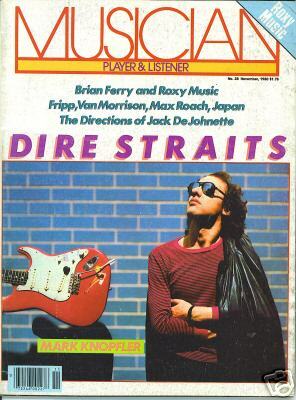 This have never really been pointed out, but to me and my guitar friend in the 70s it was common knowledge that Mark Knopfler played 08 sets on the first two Dire Straits records. When you listen to those records it´s obvious that the guitar strings played on are very thin, because when Knopfler pulls them, like before the first verse in Once Upon a Time in the West, the sound is extremely soft in a way which is never the case with 09 sets. It actually sounds like the strings are tuned down when they in fact are not. However we were disappointed when we found out, from the Musician article you mention above, that Knopfler had started using 09 sets and – even worse – started playing Schecter guitars, so the rest of 1980 were spoiled for us. When we actually heard Making Movies for the first time we were upset like two mad dogs because the warmth in the guitar sound had slightly disappeared, and we knew it was all due to those damned Schecter guitars with those damned 09 strings. We came over it, and today when we play professionally we use – you´ve guessed it – 09 strings (but never Schecter guitars). Thanks for your comment, Hans. Everyone thought he was playing 09, but I also found hat 08 sounded more than Knopfler and started to use them. And I also loved that Fender sound and was shocked about that bad guitar sound when I first heard the Schecter live. 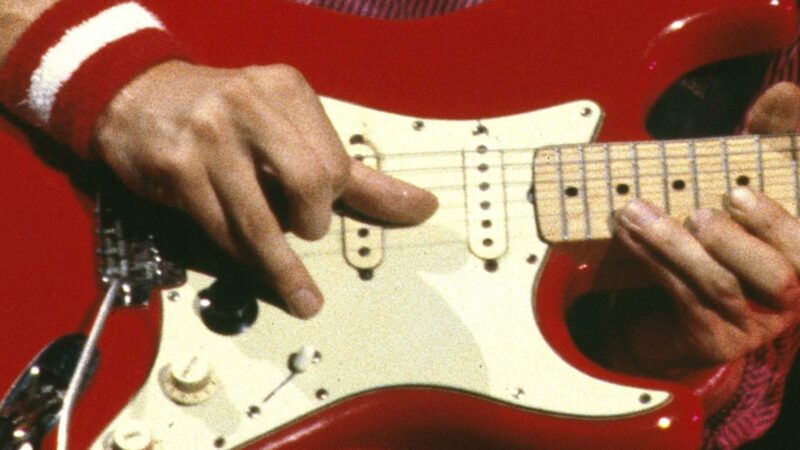 Even Knopfler admitted that the Fender sounded better but he said it was pretty hard to play. I however noticed that people who became aware of DS later all love the Schecter sound, it seems to be a matter of what you grew up with. Anthony, in fact I love these spiral cables, they disappeared but are back now it seems,some manufacturers produce them again. I have the vintage coil cord from VOX which is great and sounds good, it seems Fender also makes one again. Don’t know what Mark had back then, maybe it was a VOX. Just played along to the 2nd Sultans Single that was released which I only have on vinyl so not something I do often, but there are a few crying bends on the B string that I could never get to sound right on the b string with a 009 set of strings but worked better on the high E string but I usually avoided bending there as it always feels a bit unstable in that position, anyway I think you’re dead right if the b string was a lighter string ie as in a 008 set, it would work a treat so I’ll be restringing with the 008’s I have very soon. Yeah D’Addario are different 011 with the 9’s 0.010 with the 8’s. Always the possiblity of a custom mix maybe even a 009 for the B string too. Ingo can you recommend me a cable with very warm tone and sweet highs to buy? I ask someone and told me that coil cables haven’t warm sound. (But fender have one premium koilcord and says it have extended chime highs and balanced tone but I don’t know how it will sound.. I don’t see why a coil cable should sound different than a straight one, to my experience or knowledge, the sound of a cable is simply a result of its capacity (which results from the length and the distance between shield and inner lead). I like the Vox vintage spiral cord, the Fender might be similar. Hi, The Extra Lights today as you know are still the same, the 16 instead of 15 and 42 instead of 40 are the ” PLAIN ” light. The Fender Extra lights are as what you said. Gauges 09-11-15-24-32-40. Thanks for the string knowledge. There is much to say about reality and vodoo when it comes to the importance of the cable for the guitar sound. I will cover this in a coming article. Yes Ingo you have right. I can give more analytical descriptions about that cable (or others from the best of market that I have try) like the capacitance, sweetness, tone, or the differences between them but I think you can give more experienced info informations about that. Hi my friend Ingo, I want to get the tone of the 1st & 2nd album of DS, should my middle pickup on the strat be rw/rp or not? Thank you infos from your that great site. First, I don’t see any reason why a reverse wound PU can sound different (unless it is out-of-phase which seems not to be the case with MK’s Strats). It is rather a thing of hum cancelling. Secondly, in those days rw/rp were not available as such so he should have stock PUs. Thank you. Because I had tried in the past without rw/rp the middle PU and the tone was different than with a rw/rp (but without the hum – canceling of course. That great DS licks you play seems you have a rw/rp pickup. The tone was like a mix when you play with the middle position alone (clear) and a bridge position alone (clear again), but without that muddiness from the hum canceling and had a colder sound. I don’t know if you have tried it. I have stock PUs in all guitars, only one Squier (not the one in the video) has a ’55 PU in the middle position that has reversed pole pieces (and is for this reason connected differently so that it is still in phase). As said, teoretically it should not change the sound . The only possible reason might be the reverse pole pieces. Maybe they attract the strings differently and the amount of “Stratitis” you get is different. If so, this should be mostly when the distance between strings and magnetets is small. I have the duncan surfers and I have them low height. About 3mm on high strings and 4mm on low strings. Anyway thank you ! Do you think that the new orange squezzer reissue from the usa Grafton elec are the same as the original Ingo? It have a good price. Have you hear it? Can’t tell, I have never heard one myself. How about thet analogman Juicer (orange squeezer comp clone)? Is that any good compared to the original? How about that analogman Juicer (orange squeezer comp clone)? I have the analogman juicer and really like it. I would recommend it. Being fender much more than schecter, what happen with the schecter sound is that you have alchemy played with it …..and we all love alchemy. MK sounds amazingly as he want with everything. I have tried to reproduce that fat alchemy´sultans sound with lots of fender with no success, have to say that havent played much with strings gauge. Is the trick on the compressors? Of course the reason why Mark always sounds great is nothing but his playing style. The gear is only important for the subtle nuances from one tour to the other (e.g. you want the same crunchy sound or the same compression as on the get lucky tour). Almost any recorded stuff is compressed, but I think Mark did not use much (if at all) compression on stage. Ingo, do you think heavy strings give you a big sound? I am always torn between heavier and thinner strings, to me both have a unique sound and are great for certain stuff. I also feel that thin strings like 08 can sound very full, too, especially if you don’t play them too hard. just put on some Original Bullets, “Super Light”. really great strings! I used to string my Strat with 09-42, but reading this article, I wanted to try those Fender Super Light, and I can say that they are great strings. think I’ll keep them on the Strat, and going to try some 09-40 on my Epiphone G400. I really like the lighter bass side, and the .014 G string is also great. I really hate the .016 on standard 09-42, because it’s a bit too “hard” and not well balanced in tension, with the other strings. the step from 11 to 14 (or 15) is really better.